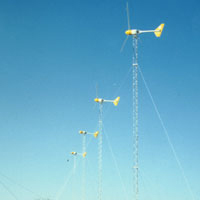 The four 10 kW Bergey turbines shown above are installed at Laredo Community College in Laredo, Texas. The systems were installed in 1992 under a renewable energy demonstration program sponsored by the State of Texas. The systems are located right along the Rio Grande river separating the U.S. and Mexico. These systems were originally installed on 80 ft. guyed-lattice towers as wind-electric pumping systems for an experimental farm operated by the Center for Maximum Potential Building Systems. The plan was to pump water from the Rio Grande for irrigation. Unfortunately, there were many problems with the pumping scheme, including heavy sediments and pollution from the river water. In 1996, it was decided to convert the wind turbines into grid-connected units to help the College reduce its utility bills. This change required new alternators, Powersync inverters, and the installation of an equipment building. The wind turbines are now inter-connected with Central Power & Light, reducing Laredo Community Colleges utility bills by about $250 per month.